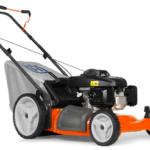 Referred to as either "pluggers" or "spikers" lawn aerators are used for loosening compacted soil without killing existing grass. 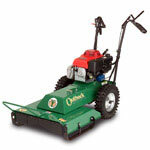 Toomey Rents carries aerators in two styles - core aerators and spike aerators. Core Aerators, or "pluggers," are a bit like cookie cutters for your lawn. While being pushed across your lawn the Aerator punctures the ground and removes a small core of dry soil which it then drops on the surface. The resulting cavity gives the soil space to expand and makes room for nutrients to work their way down to the grass' roots. Unlike Core Aerators, Spike Aerators simply push small holes into the soil. These holes are significantly smaller than the plugs pulled by the other machine but can be useful in helping water better saturate your lawn. Lawn problems are frequently blamed on insects or disease but this isn't always the case. Compacted soil can result in brown spots and even dead or sparse grass growth. In a normal healthy lawn nutrients are spread various different ways - when soil has become too tightly packed these nutrients never make their way down to your lawn's roots. 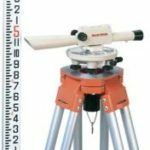 One simple test you can use to determine if your lawn needs aeration involves sticking a screwdriver into the areas of your lawn which are problematic. 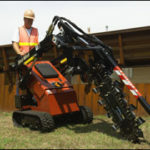 If the screwdriver can easily move in and out of the soil then aeration is probably unnecessary, if the ground is hard and dry, and the screwdriver requires significant force to enter the soil then an aerator is a good place to start. 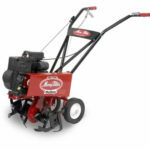 For lawns where the ground is soft but the grass is sparse you'll want to use a slice seeder or seed spreader instead. Generally there are two things to consider before renting an aerator. Toomey Rents recommends aerating before seeding and after a light rain. The best aerating conditions involve soft moist ground. As for time of year? If you're aerating to fix a problem with your lawn it doesn't really matter so long as you plan around your seeding and the weather. For maintenance, though, we recommend either late fall or mid-to-late April. If you're lawn is really dry and compacts easily you might want to aerate twice a year. You can aerate your lawn every other year as long as the grass is lush and the soil is soft. Before aerating you should always scan your lawn for large rocks, stones, and other debris. You should also take the time to mark sprinkler heads and other inground items. While you can aerate a lawn that has a sprinklers, running over a sprinkler head or the sprinkler box may cause damage to your irrigation system. Try to stay a few inches away from these and then aerating those spots by hand. When you pickup an Aerator Toomey's staff will cover a lot of the basics. Below are some highlights. Start engine and adjust throttle to a comfortable walking speed. Adjust the depth knob to desired depth. Turning the knob clockwise will decrease depth while counterclockwise will increase it. Push down on rear wheel handle to lower aerating tines into the ground. Engage clutch control to begin aerating and adjust throttle as necessary to attain comfortable walking speed. To turn the aerator lift up on the rear wheel handle, turn the machine around, and then push down again to engage the tines. 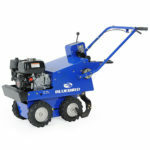 While Spiker Aerators are small and relatively light (you provide a concrete block to weigh them down for aerating,) Core Aerators are large and heavy. With depth control weights in place the machine weighs close to 250lbs. We recommend a pickup truck, cargo van, or other large cargo vehicle to take away an aerator.